They are a small, family friendly farm in Cattaraugus County, NY. They have been involved in the farming industry for several years, doing everything from working on the farm- milking cows, raising beef cows, swine, or chickens. After they got married and bought their house with a barn and some land they had some research to do to figure out how they were going to fill it. 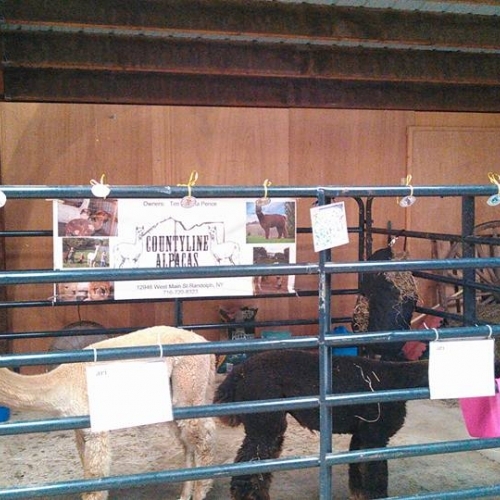 They spent several years doing research about alpacas and talking to anyone they could about alpaca ownership. They learned so much and had made many new friends along their journey in becoming alpaca owners. Visitors are welcomed to the farm to hear more of the story and learn about the animals. There are alpaca socks in various lengths and weights for sale as well as yarn. Please call 716-720-1680 to schedule an appointment.